Who doesn’t want ideas for Building a Mother Daughter Relationship?!? 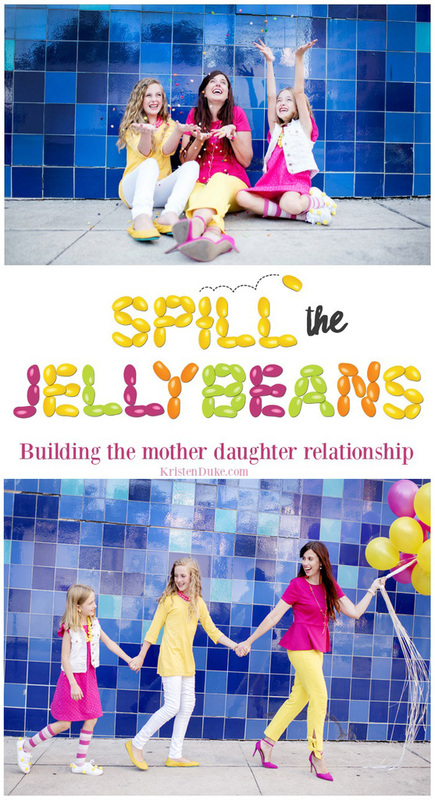 I’ve been waiting to SPILL THE JELLYBEANS for a while now, with a fun new venture my girls and I are taking on! My daughters and I started a YouTube channel! Along with that, we’ll be sharing everything on our Instagram account, so follow both! Building Mother Daughter Relationship Ideas are all over the place, but it’s hard to know exactly what to do to have a close bond. I don’t know that we’ve got all the answers to solve the teenager mother daughter crises, but we are sure going to have fun trying! My girls and I have come up with endless ideas and challenges to share with you, so that you in turn can have conversations and fun together! We will be doing some fun stuff and serious stuff, all while striving to be openly communicating. I personally want to share about topics that maybe be difficult to discuss. As I talk to my girls about body image, friendship, bullying, healthy living, and even BOYS, I hope it opens a door for other mother/daughter duo’s out there. There have been a few videos on other channels that my daughters and I have watched together, which started a discussion after, and I’ve been grateful for that. Hoping to do the same. My girls love watching challenges on YouTube, so you’ll be seeing some of that, too. We already filmed a “who knows mom best” video where I’m asked 10 questions and they answer. It’s pretty funny! We’ll basically have the YouTube channel, and an Instagram account, no actual website at this point. We’ll be doing some fun giveaways on Instagram next week, I’d love you to follow along and share with your friends! Here is our first video…glitches and all. Something weird happened with my memory card, but I wasn’t about to refilm this beast! It took me hours and hours to edit this, and add in the fun pictures on the video, so I hope you like it! Oh, and in case anyone is worried about my spelling, I know that most refer to them as “jelly beans” but I liked it as one word, it’s our thing. Here is the video, any THUMBS UP, COMMENTS, or SUBSCRIBES we’d LOVE! Watch the video with your daughters! PIN the top image of this post! Thanks for being supporters of our new venture!